Floods, earthquakes and hurricanes are among some of the natural disasters that can rapidly destroy terrestrial-based communication infrastructures. In other situations, including conflict zones or terrorist activity, mobile telecommunications networks may either be switched off or become overwhelmed. Deployed military in battleground regions are in constant need of connectivity. Troops need networks to remain updated regarding enemy locations, to receive orders from their superiors, and to download maps and important intelligence, surveillance and reconnaissance (ISR) data. Natural disasters such as Superstorm Sandy strike hard and fast and leave behind destruction that usually takes months, even years, for communities to fully recover. Beyond the physical damage to homes and buildings, when civilians find themselves in need of rescue, they rely on the efforts of first responders and non-governmental organizations (NGOs) in order to survive. How do you get more than three million personnel across 30,000 fire departments, 18,000 police departments and thousands of other law enforcement and municipal departments to use the same communications medium? The time and cost saving benefits of commercially hosted government payloads are no longer mere talking points exchanged between niche players in the industry and space-savvy users within the Department of Defense. 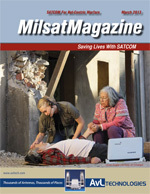 MILSATCOM Calling On Australia, There is always a need for satellite communications wherever military personnel are present. Satellites have the ability to provide communications to regions which lack stable ground infrastructure. They can deliver one-to-remote or multi-point solutions anywhere on the Earths surface and are an ideal offering for military forces that operate globally in remote locations and less than stable environments.